If you have ever had a guitar damaged by airline baggage handlers or try to lug your guitar on the subway during the rush hour, then travel-sized guitars are perfect for you. Today, I’m going to share with you one of the travel guitars: Martin Backpacker Guitar Review(or Martin Travel Guitar). In fact, there are so many options on the market but why did I choose Martin Backpacker Guitar for review? Let’s continue reading and discover by yourself. Martin Guitar Company has been around for over a century and a half producing the finest acoustic instruments in the world. They have survived through each succeeding generations over the years starting from 1833. The company has shown great adaptability to the societal and technological changes and demands in product designs, manufacturing and distribution methods. All these are evident at Martin’s expanded facility in Nazareth, Pennsylvania. The Martin’s brand is synonymous with quality in instrument making because of their versed experience in six-strings acoustic production. While it is true that the widespread opinion that their products can be a bit heavy on the pocket, unknown to many, the company does offer affordable quality guitars that usually deliver top performances that make them a bang for the buck. Martin Guitar Company is top dogs known for producing guitars with quality materials and construction. This Martin Steel-string Backpacker model’s craftsmanship is a reflection of the company’s high standard in guitar making. The option in the review is the steel-string choice. There is also a nylon-string option, and this is the only travel guitar that offers this option. The Martin Backpacker model is one of the best cheap guitars from the Martin brand I have to say. I know it will appeal to a whole lot of people of players especially the beginners, as it’s craftsmanship is superb. It is made with quality materials which make the guitar durable. When I received the Martin Backpacker guitar, I was wowed by its peculiar shape, design, and compact size. It actually came with a protected black padded gig bag and a Martin woven strap for easy storage and transportation. It is ideal and popular among guitarists that need a travel guitar that won’t be much of a problem carrying as it will be less convenient carrying a full-sized guitar. The six-string Backpacker tries to eliminate the need to carry a full sized guitar when traveling. Its compact size makes it easy to fit in small places. It is small enough to fit into airplanes as hand luggage. The Martin Backpacker feels light when held and is quite rugged. This is due in large part to its weight which is about two and a half pounds. It is designed to withstand the abuse and harsh conditions of the outdoor, so you have nothing to worry about. The Backpacker is less fragile when compared to alternatives like the Martin LX1E. You don’t need to expose your expensive guitar anymore to dirt and other harsh elements, and you should rather do that with the Martin Backpacker guitar. The Martin Backpacker will be a great music companion when you are going camping with friends and family, sit around a bonfire, hiking or off-road traveling as it is music on the move. Martin Guitar company are known for producing quality and durable instruments, and the Martin travel guitar is not an exception. Although their products are usually on the high side, this is not the case with Backpacker, as the price is quite affordable. Surprisingly, this did not affect the quality of materials used. It has the Martin signature written all over it. The build quality is top-level, and this is quite visible when at first glance that the Backpacker is made with ergonomics and convenience is the top priority. The first thing that quickly distinguishes the Backpacker from other acoustic guitars like the Martin Ed Sheeran X Signature and the LX1E Little Martin Travel Guitar is its unique shape. The Martin Backpacker Travel Guitar has an oar-shaped body that gives it the “I am different” feel. This felt weird to use on my first trial as it needed you getting used to it. I got the hinge of it in subsequent tests. An interesting aspect of the Martin travel guitar is the application of solid wood all through its construction. This decision has its effect especially in the sound of the backpacker as I noticed the sound is not as deep as what is produced by the LX1E Little Martin Travel Guitar. On close observation, I noticed the backpacker is made up of Mahogany and spruce. These materials combo is quite popular when it comes to guitar making as it offers stellar quality and sound. The Backpacker features a braced, solid spruce top, and a solid a solid tonewood at its back and sides. The neck, back, and sides are made of Mahogany which gives the Backpacker protection from abuse, and it gives it a projection that is surprisingly big. The neck has a contour shape along with a pack of six tuners in two groups of three across the Martin headstock. The Backpacker is quite attractive, and a contributing factor is it has a hand-rubbed finish of urethane. Further off the neck, you will see it is fitted with high-quality chrome enclosed tuners. One great feature I love about the Backpacker is that the fretboard is full-sized. This really is cool as you can quickly switch from a little Backpacker to another guitar without feeling off. After you are done playing, you can slip it back into it protected gig bag for safe storage. The fingerboard is a 15-fret fingerboard and a bridge with materials made from Richlite. The length of the Backpacker is 24-inch scale length, and it has white dot inlays. It lacks a pickguard or a rosette detailing but that’s not a problem is it? Martin Guitar Company tried to churn out a great sound with a real resonance despite the compact size of the backpacker. This is the most important aspect of any instrument, and the Martin Backpacker guitar has its own share of it. When I got the Backpacker, I was disappointed it wasn’t in tune. The sound produced was not well balanced. I had to do a little tuning to get it in shape. Honestly, though, the sound quality was close to nothing I had in mind. I thought it will be flat and tinny, but the sound was pretty decent. I have to say that it sound is influenced by its size and quality of materials used in production. The six-string Backpacker sounds like a banjo in my perception, but it still resonates right and booming sound thanks to its mahogany’s body makeup. For its size, the Backpacker Produces rich and loud sound I must confess and this is because of the combination of lightly braced solid tonewood top with a solid mahogany neck, back and sides. The Backpacker is kept in tune over an extended period by the chrome enclosed tuners which are sturdy. Even if the hardware is somewhat necessary and on the minimal side, each component of the Backpacker does a relatively fine job. I can hear the impressive intonation and action delivered by the bridge right out of the box. The sound is relatively warm and offers deep tone but not as deep as the LX1E Little Martin Travel Guitar as mentioned before. Also, the frequencies are on the strong side, but they seem well covered. You should watch out for a high dose of the higher pitch, though. Another thing I found great and least expected was the absence of fret noise, as it is well-known fact that guitars of this price range tend to struggle with this. Thumbs up to Martin Guitar for that. The six-string will be ideal for solo practice, any impromptu performance or if you need an accompaniment with vocals. Like every acoustic guitar, one of the downsides of the Backpacker is there were a few trade-offs for its compact size and quality and this reflected primarily and its sound quality. The Martin travel guitar is just too small to produce the quality of sound expected of a full-sized acoustic guitar. This is evident in the bass response you get when played as it is below par in comparison with a larger model. Among all the travel guitars I have tested, the seems to be the easiest to play. The Backpacker is very easy for transportation and traveling, this is due to its slim, light and portable design. The material make-up of this guitar is top quality and this makes it very rugged and durable. It is very unique because of its oar-shape. It is not one of the least expensive guitars produced by Martin Guitar Company. It can take a getting used to because of its shape and size. The Sound produced is so-so. The Body and neck are made of quality materials like mahogany and a solid spruce top. The hardware is excellent but with a minimalistic look making it unfinished at some ends all in the name of portability. The sound is not the best out there but the lack of bass makes it quite disappointing, though. A lot of sacrifices were made because of the size and portability of the Backpacker; this affects its overall value. The Martin Backpacker guitar is one of the best travel guitars for its price tag. This is so because it is easy to carry because of its lightweight and portability. The guitar is actually made for the traveler who desires music on the go. This is evident in its convenience and ergonomics. The name says it all as it is more of a recreational model. So if you need a guitar for camping, hiking or a bonfire, the Martin travel guitar will be a great option. The Backpacker sacrificed its sound quality (especially the bass) for its portability so when making a choice, you have to bear that in mind. 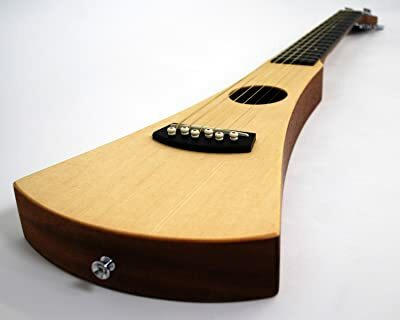 Personally, I will recommend this guitar for players who love traveling and need a portable acoustic guitar for fun playing. It scores a 4.3/5 in my personal scale. If you like my Martin backpacker guitar review or think that it have some useful, please share it with your friend!